SriLankan Catering Ltd. has recorded a steady financial performance for the financial year ended 31 March with a 26% year-on-year growth in operating profits from Rs. 3.03 billion to Rs. 3.81 billion. Its unaudited financial statements also showed that the operating profit ratio, which stood at 42% in the last year, improved to 44% during the year 2017/18. It has also reported a post-tax net profit of Rs. 3.9 billion during the year, which is a 4% increase compared to the previous year. A somewhat low growth in net profit has been reported as a result of a drop in exchange gains, which dropped from Rs. 833 million in the previous financial year to Rs. 202 million this year. 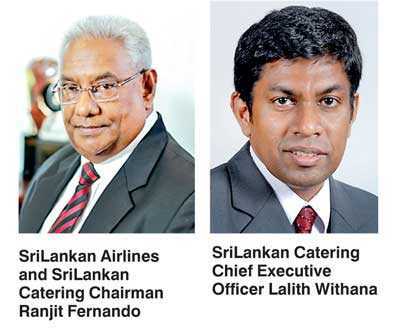 SriLankan Catering Chairman Ranjit Fernando, who is also the Chairman of SriLankan Airlines, said: “SriLankan Catering continues to be a tower of strength to our nation and the SriLankan Airlines Group. SriLankan Catering is a fully owned subsidiary of SriLankan Airlines, and provides approximately 24,000 inflight meals per day to airlines that operate in and out of the Bandaranaike International Airport (BIA) and Mattala Rajapaksa International Airport (MRIA). These include globally reputed airlines such as Emirates Airline, Qatar Airways, Malaysia Airlines, Air China, Cathay Pacific Airways, China Eastern Airlines, China Southern Airlines, Korean Air, Turkish Airlines and SriLankan Airlines. It is equipped with a state-of-the-art flight kitchen for the production of food and beverages, even to VIPs and private jets. It operates restaurants and lounges at BIA and MRIA, manages the transit hotel at BIA, and operates an industrial laundry service. SriLankan Catering is among a handful of inflight catering companies anywhere in the world to have three global certifications, being triple-certified to the standards of ISO 9001:2000, HACCP-Codex Alimentarius, and ISO 22000:2005. The company has won several global and national accolades in recent times, including a Mercury Award from the International Flight Catering Association, and also Presidential Export Awards and Environmental Awards.